A few weeks back I was contacted by Nature’s Path and asked if I would like to sample some of their gluten-free cereals/products. Of course I said that I was interested. I love cereal and feel like I could eat it for every single meal. Not only that, but Nature’s Path is going to be giving away a fun gift to one of my lucky readers!! How fun is that? Details on how to enter & win will be explained below. I really enjoyed these cornflakes. They had a great crisp & light sweetness to them, but nothing over the top. Great alone or mixed with other cereals. Also would be great to cook with. I used them as topping on a hash brown casserole and they worked wonderfully! Another nice thing about this cereal is that there are only 4 ingredients! 2 thumbs up! We all know that I am a kid at heart, right? Well, this cereal is great for kids & adults. These little cereal balls, which look a lot like Kix, are bursting with peanut butter flavor. Great alone, or mixed with another cereal or topped with some banana slices. I also loved these topped with Almond Breeze or Greek yogurt. Another great cereal with only 6 ingredients. A much welcomed change from those mainstream cereals with lists longer than Rapunzel’s hair. 2 thumbs up! This is one of my favorite gluten-free cereals. This cereal was recommended to me by a friend who had been diagnosed with Celiac before I was and I was looking for a way to fill my cereal void. I love to eat this with fresh fruit cut up on top. This cereal is a blend of corn, flax, buckwheat, quinoa & amaranth. Nice crunch to the flakes & great texture & flavor. 2 thumbs up! I was so excited when I saw this product on the market! I was never a huge fan of Cheerios, but I did like to eat them occasionally. Now, tell a girl she can’t have something and she wants it even more. I had tried other gluten-free Cheerios in the past and had been very disappointed. This cereal did not disappoint. The Whole O’s were crispy & had a great crunch, but were not overly crunchy like some of the others I had tried. They were the closest thing to Cheerios that I have tried since embarking on the gluten-free diet. And, once again, only 5 ingredients in this cereal. Well done, Nature’s Path! 2 thumbs up! Now for the fun giveaway details. 1. Go to Nature’s Path to see what products they have and comment below which ones you would like to try. 2. Share this blog post on your blog & link back. Comment below telling me that you have done this. 3. Add me to your blog roll for an extra chance at winning! 4. That is it! Have fun!! Contest is open until Wednesday, August 12, 2009 at midnight. A winner will be chosen & announced on Thursday. I like the sound of the Mesa Sunrise cereal. It sounds like something a little different from the typical g-free cereals. The Whole O’s sound good too. We’ve tried the Panda Puffs before, but I’m up to trying them again! My 5-yr old son and I both went g-free about a month ago, and we eat the Corn Flakes every morning. I would love to try some of the EnviroKidz cereals, like the Leapin’ Lemurs or the Gorilla Crunch (which I’ve heard is quite good). Thanks for the review! I have only found the animal cookies at 1 store so far. I agree about Nature’s Path…..awesome stuff!! i also linked your give-away on my blog! I’ve had the Mesa Sunrise and loved it, but I would really like to try the cornflakes! I just love Panda Puffs and would be thrilled to win some. Thanks for the giveaway! Awe, what a fun giveaway! Girl, you are already on my blogroll…..wink! Peanut Butter Panda Puffs for sure!! Mmmmm if these are anything like Barabara Peanut Butter Puffins, I’ll be in heaven! If you like the corn flakes you will love the mesa sunrise! We love the Nature’s Path instant oatmeals, so I am sure the regular cereal is also great. The Panda Puffs look fun to try. PB Panda Puffs, definitely. I think they would be like Reeses Puffs, which my brothers and I devoured when we were kids! Thanks Kelly! I love the Panda Puffs! Oooo, so much good stuff! OH their granola is divine! Waffles would be fun to try! Oh geez, I can’t pick just a few! I want to try it all! link in my next post! I haven’t tried any of their products, but they all sound great! I think that mesa sunrise sounds awesome! The Mesa Sunrise cereal rocks! 🙂 I love it w/ vanilla almond milk! I haven’t tried any of their products – I have almost bought them so many times, though! I think I would want to try the Panda puffs. They sound like they would be a good little treat for me. I typically eat the GF corn chex or rice chex every day, and they get a little boring after awhile! These would be a nice change of pace for you! I would like to try the Nature’s Path GF waffles. The waffles rock!! 🙂 I love them w/ Almond Butter & fruit spread. I would love to try the Peanut Butter Panda Puffs! They look great! Thanks Missy!! We love the Panda Puffs! Panda Puffs, the poor (wo)man’s version of Barbara puffins. Mmmm…. would love me some of those. I would love to try the whole o’s! I can’t believe there is a good sub for cheerios! My kids love most of their cereal that we’ve tried! I was shocked that they tasted so good after the other GF Cheerio imitators I had tried. You will love these! omg i really want to try panda puffs! love this giveaway! flax plus pumpkin raisin crunch cereal is something i’d love to try. great giveaway! Nature’s Path cereal is great! I love the blueberries and cinnamon and peanut butter panda puffs. Would love to try the strawberries and cream or their new pop tarts. panda puffs look most interesting!!!! Thanks for entering! THe Panda Puffs seem to be very popular! I haven’t tried these cereals because they’re so expensive for me right now, but they all sound delicious, especially any with peanut butter. YUM! Love to try the panda puffs! YUM CEREAL! i would like to try the blueberry optimum, or banana almond, optimum slim, cranberry zing or the shreddies. YUM YUM! Ooh! I’d love to try the flax plus hot cereal! I’ve never seen that one, but have seen the enviro cereals at Whole Foods and at my local Kings!!! I’m going to figure out how to add you to my blog roll! Added your contest and you to my blogroll! you are def. added to my blogroll!!!! all the bars look great but Pumpkin Flax sounds yummy. and of course the animal cookies. Awesome giveaway!! I would love to try the fig waffles or the Leapin Lemur cereal! Wow, they have so many great cereals – I’d love to try them all!! But if I had to choose – Hemp Plus granola and Peanut Butter Panda Puffs sound delicious! 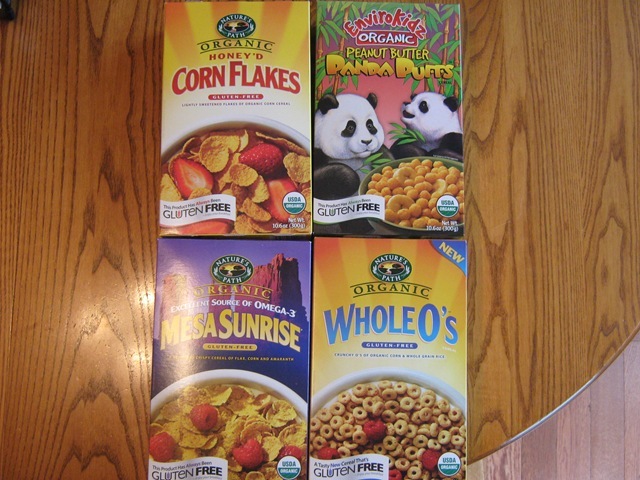 I love Mesa Sunrise and the Enviro Kids cereals but would love to try the Whole Os. I used to love Cheerios and miss them now that I can’t have them. I have tried other GF O cereal and not found anything that tastes better than cardboard. I’ll have to look for the Nature’s Path Os to try them! Thanks for the review, Kim. OMG I am a total cereal monster! My son is a Peanut Butter Panda Puffs fan!!!! I LOVE Nature’s Path! The agave flax plus granola and blueberry cinnamon cereals are amazing. I’d love to try everything they make– Maple Pecan Crunch sounds especially good right now!